Honda is known for making some of the safest vehicles on the road today. Drivers in Milwaukee and Waukesha trust their Honda to give them and their families years of reliable service. Routine maintenance is important to maintaining safety and reliability. When it’s time for brake service, repair or replacement you can trust the experts at Honda City. Your vehicles brakes allow the car to slow down and stop, and is often the most important part on your car to prevent a collision. The brake systems on your Honda are becoming more advanced and understanding it is important so that you know when to have the components replaced. Similar to how your gas mileage will vary depending on where you live and how you drive, so will the lifespan of your brakes. We recommend every 20k to 30k miles to keep your brake system components performing at their best. The part of the brake system that needs to be replaced most frequently are the brake pads. These are the parts that provide the friction to decrease your speed and come to a complete stop. They are made to naturally deteriorate over time as they are used. As this happens there are some warning signs that drivers can expect, such as squealing or grinding. Other indications may be the car pulling when applying the brakes or a loss of responsiveness. If you notice any of these, your brake pads need to be replaced immediately. Honda City will also have a master certified technician inspect the other components for damage. You can decrease the amount of wear on your brakes by avoiding hard or sudden braking unless it’s absolutely necessary. Using Genuine Honda Parts such as brake rotors and pads keeps your car running like new for longer. 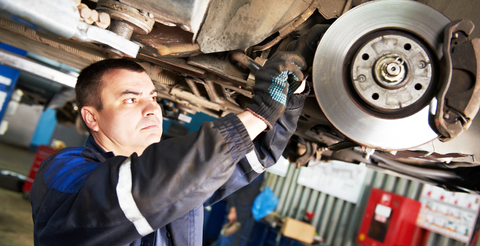 When getting your brakes serviced, ask for the fluid to be flushed and replaced. Watch your speed, having to slow down from a higher speed causes more stress to the brake system and can cause premature wear.